Your mind is full of thoughts, ideas, and memories that long to be shared. But you’re not sure just how much to share with your friends, how fleeting those thoughts are, whether you feel comfortable enough putting them in the mind of someone else. Consider then regularly keeping a journal. “In particular, journaling can be especially helpful for those with PTSD or a history of trauma,” according to Positive Psychology Program 83 Benefits of Journaling for Depression, Anxiety, and Stress Management. To adult survivors of emotional child abuse, putting words to their thoughts and feelings can be particularly challenging. You are used to stifling any thoughts or ideas that run contrary to the audiotrack inside your mind that your toxic parents recorded for you so long ago. That’s precisely why you should consider journaling. In the George Orwell novel, “1984,” the main character Winston keeps a journal, which is an act of defiance, for it enables free thought and expression, both forbidden by the dictatorship in which he lives. When he begins writing in the journal, commenting on what he thinks and sees as discrepancies in the Party rule, he begins to better understand his own thought process and attempt to break free from the mental control the Party has on him. Likewise, adult survivors of emotionally abusive parents have had a mental war waged against them during their formative years. Some of them may have scrawled in notebooks, expressed themselves in song or art or theater or sports, or just acted out in a misguided attempt to set themselves apart from their parents. But journaling enables the adult survivor to dig deep into themselves and unearth what has been placed in their heart, go over the memories that have plagued them, and document what events have deeply affected them. “It’s hypothesized that writing works to enhance our mental health through guiding us towards confronting previously inhibited emotions (reducing the stress from inhibition), helping us process difficult events and compose a coherent narrative about our experiences, and possibly even through repeated exposure to the negative emotions associated with traumatic memories (i.e., “extinction” of these negative emotions; Baikie & Wilhelm, 2005),” according to Positive Psychology. A method of tracking actual conversations with emotionally abusive parents. Many emotionally abusive parents gaslight their children by changing plans, switching words, pretending not to have said certain things. 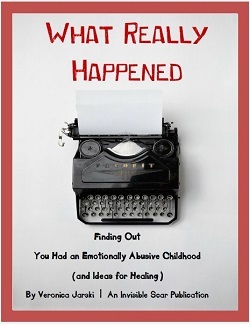 Writing it all down helps the adult survivor validate the reality of what happened and not rely on the abusive parents’ untrue account of the incident. A tool for reflection. You can look over certain memories, facing them can strip them of their seemingly debilitating power. By putting what seems overwhelming onto paper, you get to look deeply into the face of facts and rob them of their mystery. You then can better deal with what happened and proceed to navigate through those emotions. A springboard for sessions with your therapist. A journal can provide some help in streamlining conversations with your therapists. Your mind might be all over the place with different people, places, and moments. If you take a journal, you can pinpoint exactly a topic for discussion with your therapist. You can also read the words aloud if you find yourself tongue-tied in front of a new therapist or feel too overwhelmed at the time to express yourself. A map of your route to good mental health. Your journal need not only for bad memories or thoughts. You can (and should!) include good moments in your healing process or even just good days that you have. Your road to mental health is to be celebrated. Every milestone, every moment of you being the you that God intended rather than the creation of your abusive parents, is a beautiful moment to record. Health benefits also arise from keeping a journal. Not everyone loves writing down pages and pages upon words. So how do you start journaling when you don’t feel comfortable writing? You can write anyway. Just ignore your ideas about proper grammar, punctuation, or sentence structure. This is your journal, not your high school English teacher’s assignment for you. Ditch those ideas of writing well when you write in your journal. Draw. Sketch out a drawing of your childhood home, pet, friend, etc. Scrawl down what you see in your mind and don’t worry about who is going to see it. Because that person is YOU. This is all for you, all for your emotional health. Add copywork. Heard a song that expresses your feelings? Write the lyrics in your journal. Read a poem that means exactly what you mean? Copy it down. Saw a movie that made you think of your own childhood? Jot down the name just to record that you saw it. Whatever helps your mental health can be added to this journal. Remember that this journal is for you. Once you start thinking about other people reading it, you’ll hinder your journaling. This journal is a gift to yourself, to remind you where you have been, where you want to go, and how you’re getting there. It is especially helpful, for me anyway, to describe my life with a narcissist from my childhood. I’ve been keeping a journal for decades, at first as a reality check against gaslighting. Each day write “Success” and then write every positive thing that you did or that happened to you. If you can make it a habit the cumulative effect may help restore the balance that was stolen from you. Make a regular appointment with yourself to read your old entries as future you who is your best friend. When you see something noteable or even cringeworthy write in a different color or font what your best friend would say. A true best friend will celebrate your victories but also tell you when you fucked up. The difference is that she will still love you regardless. There is something important about getting stuff that is buried in the deep dark out into the light. For all the reasons you describe, I have found keeping a notebook/journal helpful. Using my voice out aloud is something I have found hard, and writing is sometimes easier, and helps as a first step to speaking. Now that we are adults we can try to find words for the things that hurt as as children and which we just couldn’t speak about then. Sometimes it is still so hard to speak and often one is on one’s own – then writing is helpful and freeing. I often need to draw different stick figures (little child ones, dragon stepmothers with lashing tongues, little me, adult me…) and let them tell, and tell and tell, and ask, and swear, and cry, and wonder, and celebrate, and go around and around in circles. Often someone else has said something so well, and I copy it, delighted ‘yes, yes, that is how I feel, or just what I mean!’ In my journal, there are several extracts of Invisible Scar posts (underlined,, highlighted, commented on) – thank you Veronica for saying things so well, for starting conversations with parts of me that didn’t know how to begin. Dag Hammarskjold, Secretary General of the UN from 1955 to his death in 1961, kept a journal from the time he was about 20 years old – “These notes?” he wrote,”They were sign-posts erected after you had reached a point where you needed them, a fixed point which was on no account to be lost sight of.” Extracts were published with his permission posthumously and the collection was called ‘Markings’ though could possibly be more accurately translated from the Swedish ‘Vagmarken’ as ‘Way-markers’.